These Individual Chicken Pot Pies are easy to make, stuffed with chicken, carrots, and celery, and topped with a delicious flaky buttermilk crust. Chicken pot pie is one of my favorite meals. It’s everything warm and comforting about food all wrapped up in a flaky pie crust. The thing is though, they’re kind of big. And messy. And did I mention big? When you’re not cooking for a family, there’s no way you are finishing one off unless you are eating leftovers for days, which is just not my thing. Whelp, problem solved: Let’s make some Individual Chicken Pot Pies! 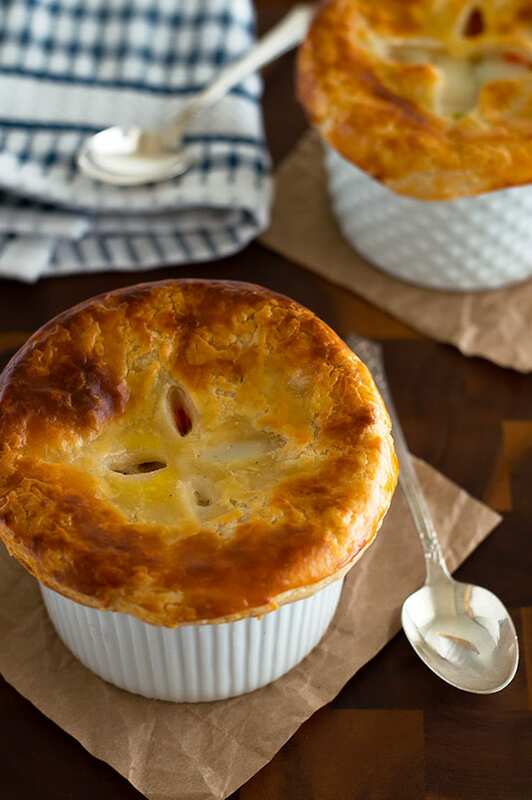 This recipe is super scalable, so you can follow this recipe exactly and make 2 individual pot pies or you can scale up to make 12, making them perfect for quiet nights in or serving a small crowd. Bonus: you can customize them to your heart’s content. Like peas? (Ew. Gross. I don’t.) Add some peas. Like corn? Throw some corn in there. Don’t feel like making your own pie crust. You can totally cut down a store-bought crust or use puff pastry over the top instead. 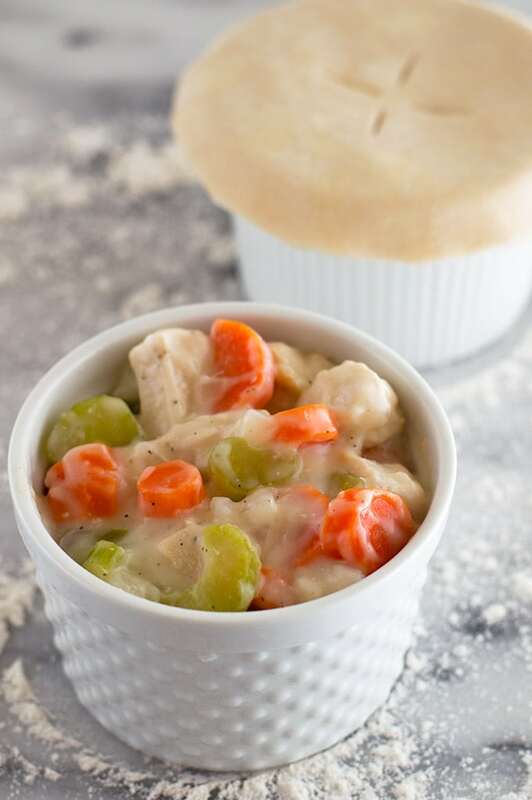 The pot pie filling is a simple mix of carrots, celery, and chicken simmered in chicken broth. It takes only a few minutes to throw them together, then you let that simmer away, make a tasty chicken gravy and stir everything together, and boom. Perfect pot pie filling so good you’ll probably be tempted to just eat that and call it a night. Pop the mixture into some ramekins, roll out some dough, lay, bake, and eat. When you’re done, you have a perfectly portioned serving of the world’s best comfort food sitting in front of you. You’re probably going to have some pie scraps left after making these pies. 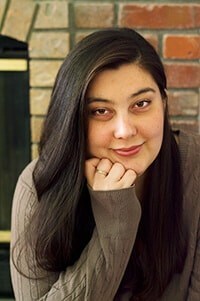 Check out my post, What to Do With Leftover Pie Dough, for some fun ideas to use up the extra! 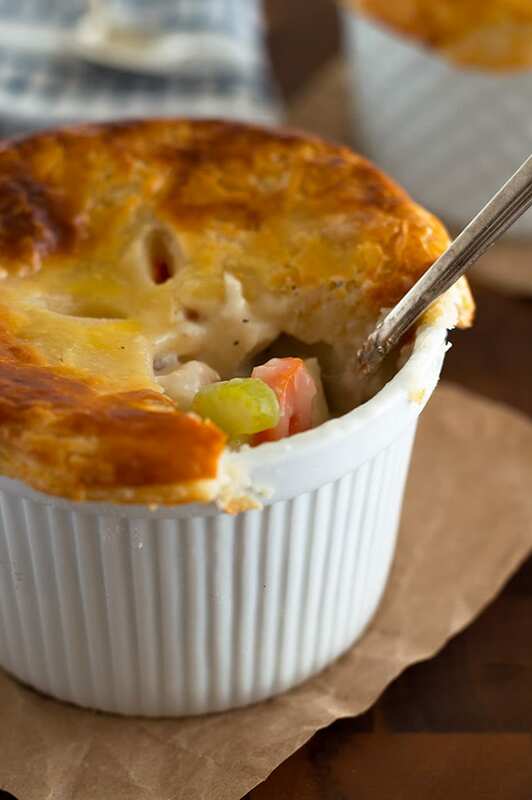 Individual Chicken Pot Pies are easy to make, stuffed with chicken, carrots, and celery, and topped with a delicious flaky buttermilk crust. Prepare pie crust. At the end of the chilling time, start the pot pie filling. (If using store-bought, frozen crust, remove from freezer so you will be able to cut it.) Preheat your oven to 425°F and line a baking sheet with foil. 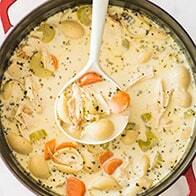 In a medium pot, combine cubed chicken, carrots, celery, onion, and chicken broth. 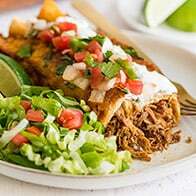 Bring to a simmer over medium-high heat and cook for 15 minutes, until chicken is cooked through and vegetables are just fork tender. Drain chicken broth into a separate container (do not discard). Measure out 1 cup of reserved broth (you can discard the rest) and 1/3 cup milk. Set them next to the stove. In a medium saucepan, over medium heat, melt butter. 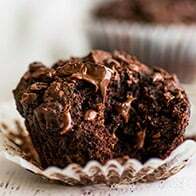 Whisk in flour and cook until flour is golden, 30 seconds to 1 minute. Slowly whisk in broth and milk, whisking out any lumps as they form. Cook, stirring constantly, until mixture thickens and begins to bubble, 2 to 5 minutes. Remove gravy from heat, stir in salt and pepper and chicken and vegetable mixture, and divide between 2 12-ounce ramekins. Allow chilled dough to sit at room temperature for about 5 minutes to soften slightly so you can roll it out without it cracking. While your dough sits, make the egg wash. In a small bowl, whisk together egg and milk, and set aside. On a well-floured surface, roll out the first disk to 1/8-inch thick and drape over the first filled ramekin. Trim the extra, leaving about 3/4-inch overhang. Gently press the edges over so the dough drapes over the sides slightly (it won't sit flush). Use a sharp-tipped serrated knife to cut a couple slits in the top for steam to escape. Repeat with the second crust and ramekin. Brush egg wash over the top of the pie crusts. Place ramekins on your prepared baking tray and bake for 15 to 20 minutes until tops are golden and filling inside is bubbly. Cool for at least 5 minutes before serving. Enjoy! 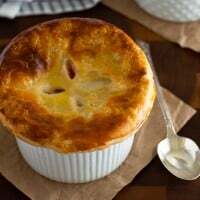 If you don't own 12-ounce ramekins, you can make these mini pot pies in oven-safe mugs or make a single 6-inch pie (if making a single 6-inch pie, don't divide the pie dough when you make it since you will only need a single piece of dough to cover the pie). If you'd like to make a 9-inch pie, double the recipe. 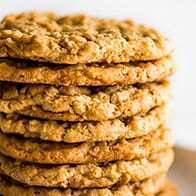 Approximate nutritional information assumes 30% dough waste and was calculated using 2% milk. For the most accurate information, use your favorite nutrition calculator to input your exact ingredients. This post contains affiliate links, which means I receive a small commission if you make a purchase using them. There is absolutely no additional cost to you.